Holiday Recipe: Mix complex family histories with pressure to have fun. Add in travel fatigue and general exhaustion. Don't forget a dash of unease at the disruption to your daily routine. Let simmer over the holiday season. You will get a mix of fun times sprinkled with frustration, exhaustion and annoyance bubbling up to the surface at exactly the time when you want to be your best self and just be happy during the holidays. 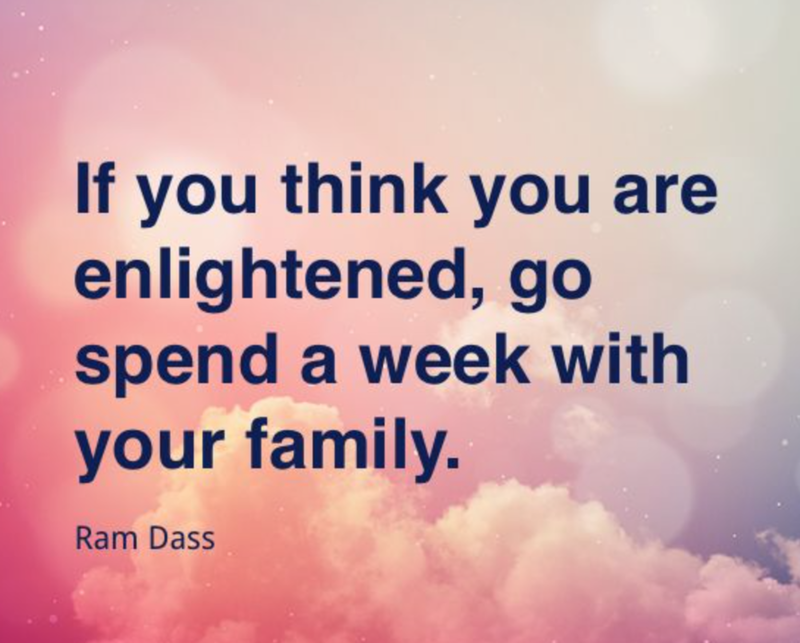 As Ram Dass once said, “If you think you are enlightened, go spend a week with your family.” The holidays can be both joyous and challenging. No matter how often we practice peacefulness and calm, our long and ingrained history with family members and the stress and pressures of the holidays can often spark a mix of emotions this time of year. Mindful Tips for Getting Through the Holiday Season. (1) Be Kind. As the Dali Lama said, “Be kind whenever possible. It is always possible.” How, you ask, can we be kind when we are feeling exhausted, frustrated or annoyed? First and foremost be kind to yourself for feeling this way. It is completely normal and natural, and there are millions of others who feel exactly the same way. Kindness and compassion for yourself will relieve any pressure you feel to be happy and smiling throughout the entire holiday season. Next, be kind to others. They are also feeling holiday stress and need a little extra understanding and love this time of year. (2) Take a break. Take time for yourself. Even though there is tremendous pressure to spend 24 hours a day with family members, especially when you rarely get to see them, be sure spend a little time alone and give yourself the opportunity to regroup, relax and rest. The time spent together when you are feeling calm and rested will be that much better if you give yourself some time to unwind. So, take a walk, meditate, or take a nap. This is your holiday too and you deserve it. Remember this will not only serve you, but it will also serve those around you if you can rejoin the group refreshed and rested. (3) Show compassion. Especially this year, we are all feeling a bit on edge and uncertain about the future. Many of us will face family members with different political views. There are two ways to show compassion this year for people experiencing such raw and sensitive emotions. If emotions are running high, make your Thanksgiving table a politics-free zone. You can choose to simply agree not to talk about politics. It will all be there to discuss and debate after Thanksgiving. Alternatively, you can take this opportunity to agree to really listen to one another. Set ground rules that you will each listen with curiosity and openness to the other’s point of view. Forget trying to prove you are right, and instead, simply try to cultivate understanding and compassion for another point of view. (4) Foster Connection. Time together is a wonderful time to foster deeper connections with one another. One way to do this is to start a conversation that will give everyone the opportunity to learn more about each other and about ourselves. Start a conversation around the Thanksgiving table and ask everyone to reflect -- kindly and compassionately -- about what they learned this year, and how what they have learned has changed them. Leave judgment and criticism aside, and remember to listen and be open to what you can learn. (6) Smile, breathe and go slowly. Thich Naht Hanh once said, “Smile, breathe and go slowly.” This is a wonderful mantra to repeat during the holidays. Smile because you are alive. Breathe because it allows you to feel present in your body, and gives you a moment to pause and simply be grateful for each breath. Finally, go slowly. We move so fast most of the time, so use this time to go slowly and be present for each moment. Each moment matters and when added together these moments make up our life. So, take each moment as it comes. Experience your life as it unfolds. Smile and breathe.